I keep reading, as usual, and I keep buying more and more books despite having more than 20 of them on my TBR list waiting on my bookshelf. But hey! I’ve already admitted that I cannot help it. 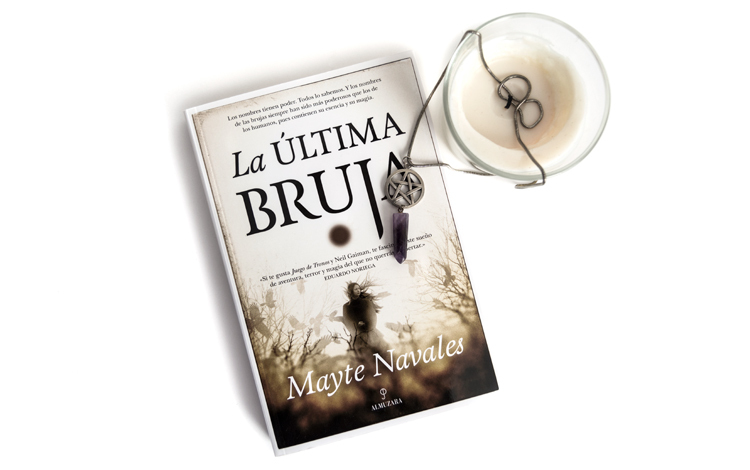 La Última Bruja is one of the last books that I’ve bought and, very likely, the one that has hooked me the most during this year (although perhaps that is not surprising given my “little” obsession with witches). I was walking around the Fnac when I saw it. It was on one of the lowest shelves in the fantasy zone, surrounded by very bright coloured books and half-hidden. Even so something about it caught my attention and just by touching it I knew I was going to buy it. As I said before, it is a fantasy novel written by the Spanish author Mayte Navales that tells the story of two witches; one who is thousands years old and who belongs to the old race, and the other much younger, a couple hundred years old. It narrates their lives and their survival throughout history until the present, a new era in which beings of power are being reborn. I hadn’t read a good story about witches for a long time but this has been, without a doubt, one of the best I have ever come across. Not only does it move away from the popular and absurd conception we have of witches today, but also it gives them a very broad moral depth and the option of being both good and evil. In summary, my favourite book from all the ones I’ve read this year. Highly recommended for all those who love the world and the history of witches as much as I do, and equally recommended for those who have never read anything about witches and are curious. I’m already looking forward to read it again!